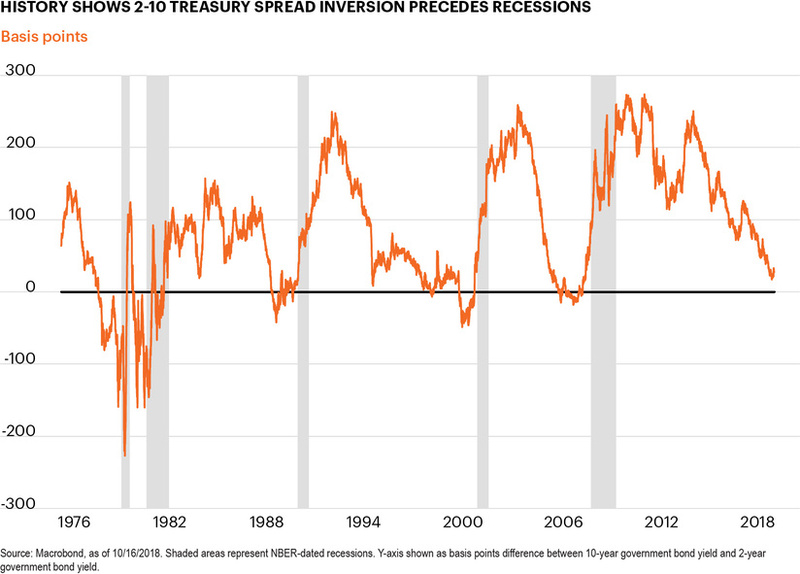 If the yield curve inverts, will a recession follow? Not necessarily, given how far from normal the current expansion and Fed rate hike cycle are. Investors should instead watch out for volatility sparked by recession fears and especially challenged traditional income sources. Yield curve inversion is creating a buzz in financial headlines and providing fodder for water cooler conversations among monetary policymakers, economic forecasters and market watchers. While the implications of a flattening yield curve for the current economic expansion are far from straightforward, we believe the impact to investors is clear. The low interest rate environment will challenge traditional income investors for the foreseeable future. Let’s quickly refresh how yield curve dynamics work. The yield curve shows interest rates across maturities, with short-term yields typically lower than long-term yields. The yield curve normally slopes up: Long-term rates are often higher because, all else equal, long-term investments carry inherent risks associated with time, including the risk that inflation could erode returns. Short-term interest rates are more closely tied to the Fed funds rate, the main policy tool of the Federal Reserve. In a tightening cycle, when the Fed is raising rates, short-term yields rise faster than long-term yields, thereby flattening the yield curve. Indeed, the typical Fed rate hike cycle ends with an inverted yield curve as the Fed pushes short-term rates above long-term rates. Yield curve inversion seems to be on everybody’s mind. The chart below shows the difference between 2-year and 10-year government bond yields. It doesn’t take sophisticated econometrics to see an important pattern emerge. Market participants, policymakers and investors take note when the yield curve flattens because every recession since the 1960s has been preceded by an inverted yield curve. Today’s economy is strong and carries significant forward momentum. But our expansion is now in its 10th year, making it among the longest in the post-WWII era, which naturally raises questions about how long economic growth can continue uninterrupted. However, the relationship between an inverted yield curve and recession is so notable that statistical models that predict risk of recession in the near term often use yield curve inversion as the most statistically significant variable. Inversion, recession, repeat? Not so fast! Second, the relationship between yield curve inversion and a recession really hinges on a classic Fed “overshoot.” In these prior tightening cycles, the Fed has proactively raised rates significantly above the neutral rate in an effort to slow the economy in reaction to inflation-driven overheating. These Fed rate hike cycles average 190 bps per year – a rapid pace of policy adjustment. I am as wary as anyone of claiming that this time is different. However, this rate hike cycle has been anything but typical. This is due, in part, to the exceptional nature of the Fed cutting interest rates down to zero during the financial crisis. The Fed has been extremely cautious in raising rates, averaging a gradual 56 bps of rate hikes per year during this cycle. This economic expansion has also been far from normal. The economy is growing significantly faster than estimates of potential growth, and the unemployment rate is 3.7%,4 below the Fed’s estimate of the equilibrium rate of 4.5%.5 Yet, despite this expansion’s longevity, economists are hard put to find evidence of building inflationary or wage pressure. The PCE deflator has averaged 1.5% during this expansion and 1.2% over the past five years.6 Key measures of wage growth are also well below levels seen in prior expansions. Finally, there are international factors holding down long-term interest rates that are amplifying yield curve flattening and could encourage yield curve inversion. Quantitative easing programs in other developed financial centers are elevating bond prices. The European Central Bank continues to hold its short-term policy rate negative and to actively purchase bonds, although its purchase program is set to wind down in 2019. The Bank of Japan aims to keep long-term yields close to zero and, at the end of the third quarter, the 10-year yield was 0.13%. In today’s global financial markets, this puts downward pressure on U.S. long-term rates. When U.S. rates rise, or U.S. bond prices sell off, international investors view it as a good buying opportunity to capture enhanced income. The yield curve has already flattened significantly over the past five years, so where do we go from here? Fed policy and the broad macroeconomic outlook point to this trend continuing in the coming quarters, with yield curve inversion possible sometime in 2019. For the economy, yield curve inversion does not automatically start a countdown to a recession. While an inverted yield curve has preceded prior recessions, the timing has varied, ranging from 10 months to two years. Moreover, long-term interest rates could be pushed down by some international event, like an emerging market crisis or a broad flight to quality, causing the yield curve to invert. For investors, an inverted yield curve would have two important implications. The first is higher volatility. Yield curve inversion will almost certainly trigger alarm bells from statistical models that use the slope of the yield curve as a key variable in predicting probability of recession. Amid model-driven warning signs, some forecasters could start calling for a recession. This does not necessarily mean forecasters will be right. Economists are notoriously bad at predicting the timing of a downturn. But heightened concern about a recession could cause volatility to rise sharply. Second, the flat yield curve is in part a reflection of the low-interest environment that has challenged core fixed income performance throughout this economic expansion. The Fed is expecting policy rates to return to neutral sometime in 2019, but neutral is still a long way from “normal” by any historic comparison. As our economy races ahead at above-trend growth, long-term interest rates are still stuck in a structural downtrend that will likely keep yields low and income challenged for some time. 1 Rate comparisons are made between yields at the close of business on December 16, 2015, the first Fed funds rate hike of this cycle, and the close of business on September 28, 2018, the last day of the third quarter. 2 Economic projections of the Federal Reserve Board members and the Federal Reserve Bank presidents, made September 26, 2018, show the median Fed funds rate projected at 3.125% by the end of 2019. 3 For the U.S., 80% of nonfinancial corporate debt financing occurs directly through capital markets, with 20% occurring through banks (U.S. Federal Reserve, Flow of Funds). 4 Bureau of Economic Analysis, September unemployment rate, as of October 15, 2018. 5 Economic projections of Federal Reserve Board members and Federal Reserve Bank presidents, September 2018. 6 Bureau of Economic Analysis, FS Investments, as of October 15, 2018. 7 For further reading on the predictive power of yield curve inversion, see “Information in the Yield Curve about Future Recessions,” FRBSF Economic Letter, August 27, 2018, and “(Don’t Fear) The Yield Curve,” FEDS Notes, June 28, 2018. This information is educational in nature and does not constitute a financial promotion, investment advice or an inducement or incitement to participate in any product, offering or investment. FS Investments is not adopting, making a recommendation for or endorsing any investment strategy or particular security. All views, opinions and positions expressed herein are that of the author and do not necessarily reflect the views, opinions or positions of FS Investments. All opinions are subject to change without notice, and you should always obtain current information and perform due diligence before participating in any investment. FS Investments does not provide legal or tax advice and the information herein should not be considered legal or tax advice. Tax laws and regulations are complex and subject to change, which can materially impact any investment result. FS Investments cannot guarantee that the information herein is accurate, complete, or timely. FS Investments makes no warranties with regard to such information or results obtained by its use, and disclaims any liability arising out of your use of, or any tax position taken in reliance on, such information. Any projections, forecasts and estimates contained herein are based upon certain assumptions that the author considers reasonable. Projections are necessarily speculative in nature, and it can be expected that some or all of the assumptions underlying the projections will not materialize or will vary significantly from actual results. The inclusion of projections herein should not be regarded as a representation or guarantee regarding the reliability, accuracy or completeness of the information contained herein, and neither FS Investments nor the author are under any obligation to update or keep current such information.